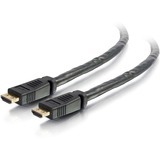 Tripp Lite's 50 ft. high-speed HDMI cable securely connects HDMI-enabled laptops, tablets, PCs, Blu-ray players, game consoles or satellite/cable TV boxes to HDTVs, HD monitors, projectors or home theater receivers. The gripping connectors help ensure components stay firmly attached to avoid viewing interruptions. 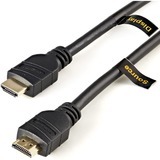 Common in home theaters, HDMI allows uncompressed digital video and multi-channel audio signals to travel together in a single cable. 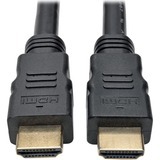 This Tripp Lite HDMI cable provides a pure digital connection that supports HD video resolutions up to 1080p, for crystal-clear picture and sound. 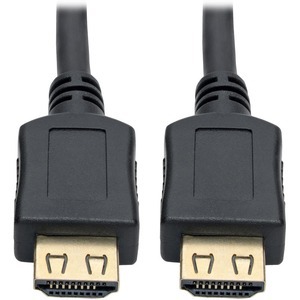 It is backward compatible with previous HDMI generations, allowing use with lower-resolution HDMI components. 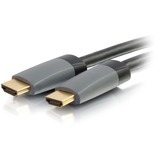 This long HDMI cable allows you greater flexibility in placing your home theater components. For instance, your Blu-ray player or video game system may be hidden away some distance from the connected display. The P568-050-BK-GRP is backed by Tripp Lite's lifetime limited warranty.